These easy DIY NO SEW FLOOR PILLOWS are the result of my hubby and daughter loving to chill on our area rug during movie nights. We have amazingly comfortable couches, yet movie night after movie night these two ALWAYS end up on the floor. More power to them, but I'm a couch type girl. Laying on the floor does not intrigue me at all! Even though we have a very comfortable area rug, I figured it would be nice to make them some floor pillows that they could use for extra comfort while we all enjoy a movie together. 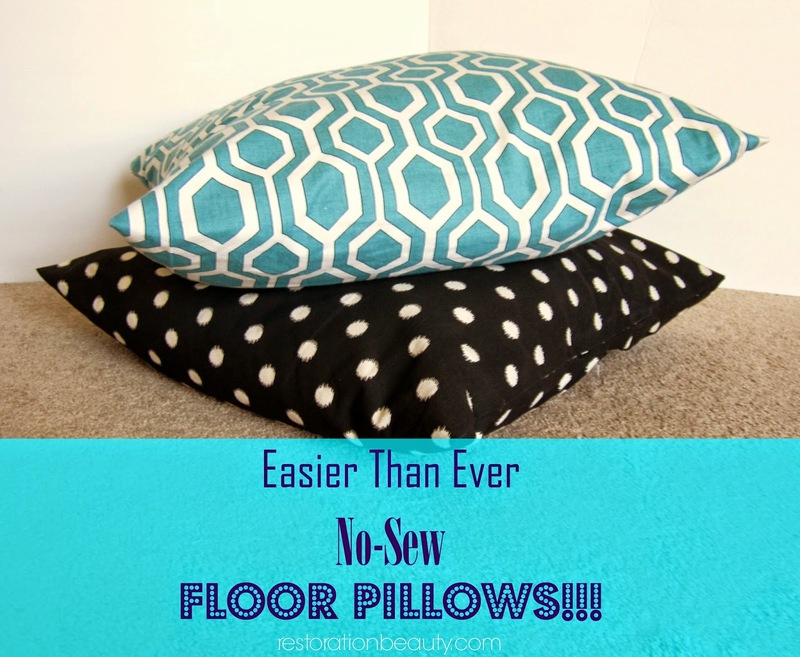 I'm telling you guys, these are the easiest no sew floor pillows, ever!! You don't even need to measure with my lazy but oh so effective method!! But my mathematician friends need not worry, I also included a formula for you, so you can get down with your bad measuring self! So, what did I use for these No Sew Floor Pillows? 1. For the inserts I used two euro pillows I was using on our bed. 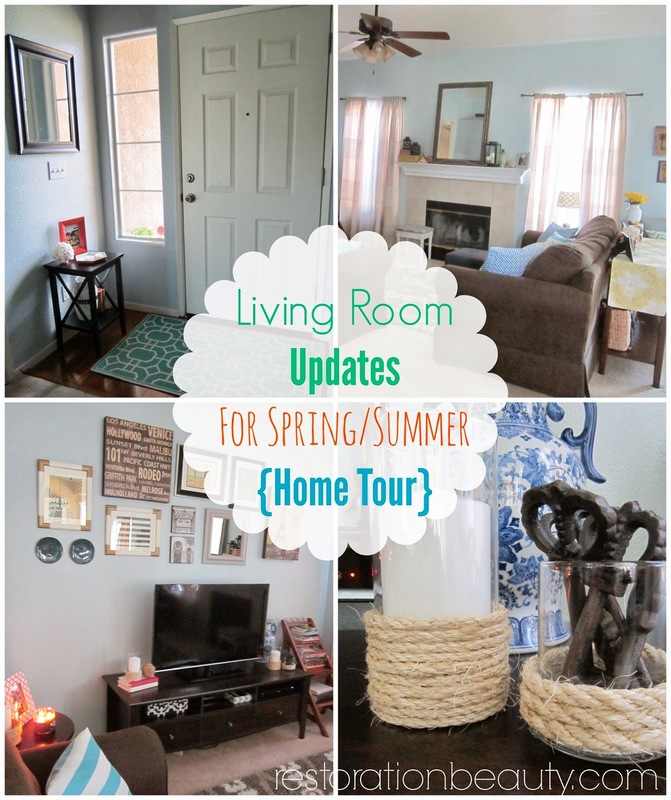 But since a makeover for that room is in the near future, I figured I could buy new ones! Euro pillows are the perfect size for floor pillows!!! And they're comfortable, too! 2. Instead of using my usual hem tape, I used fabric glue. Three words... SO. MUCH. EASIER. 3. I purchased 1 1/2 yards of each fabric from my favorite craft store, Hobby Lobby. Using my lazy method: simply lay your pillow on top of your fabric, add 2 inches (so you can glue 1 inch on each side), make a marking and that's your width! For your measuring loving people: measure the width of your pillow form and add 2 inches. Example: if the width of your pillow is 24 inches, the total width of your fabric will be 26 inches. Using my lazy method: place your pillow form on the middle of your fabric and bring the top portion of fabric over the pillow adjusting it as you go along. You want the top of the fabric to cover half the pillow. Now bring the bottom portion of the fabric over your pillow and mark where it meets your top portion of fabric, add 3 inches and make your marking. 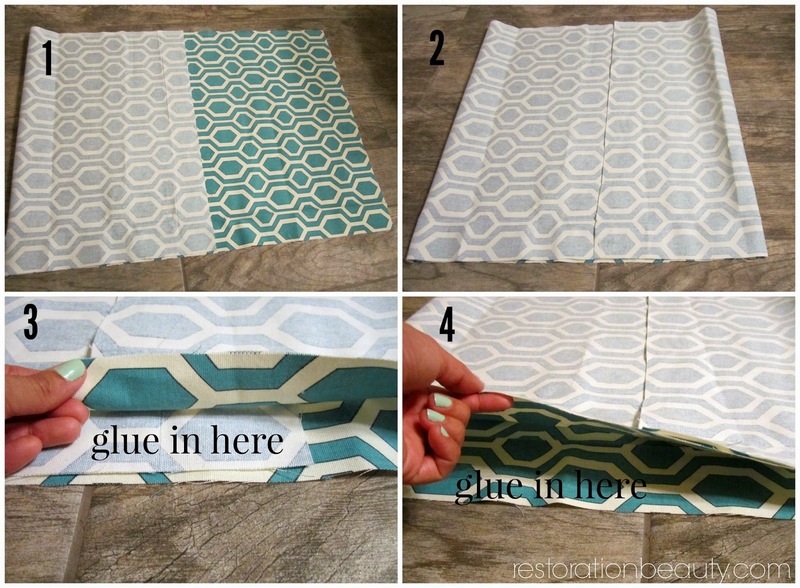 You want the bottom of the fabric to overlap the top of the fabric to give room for the pillow insert (See photo collage below). If you prefer measuring to my lazy method: just measure the length of your pillow, multiply by 2 and add 3 inches. 51 is the total length of fabric you'll need! This proves I can do math but obviously still avoid it at any cost. Does it sound crazy that I do all this just to avoid measuring? Oh well, we all have our quirks! Now for the super easy and fast tutorial!!! 1. Lay your fabric print side up and bring the top portion to the middle. 2. Next bring your bottom portion upward and overlapping the top portion by 3 inches. 3. Glue the 3 inches where the fabric overlaps but only on the sides. Do not glue the whole strip together or there will be no opening to insert your pillow! 4. And lastly, glue the 2 sides of the fabric. Once I had everything glued, I waited an hour to turn my pillow cover right side out and insert my pillow form. I also want to add that I didn't' bother "hemming" the back of the pillow cover where the fabric overlaps. 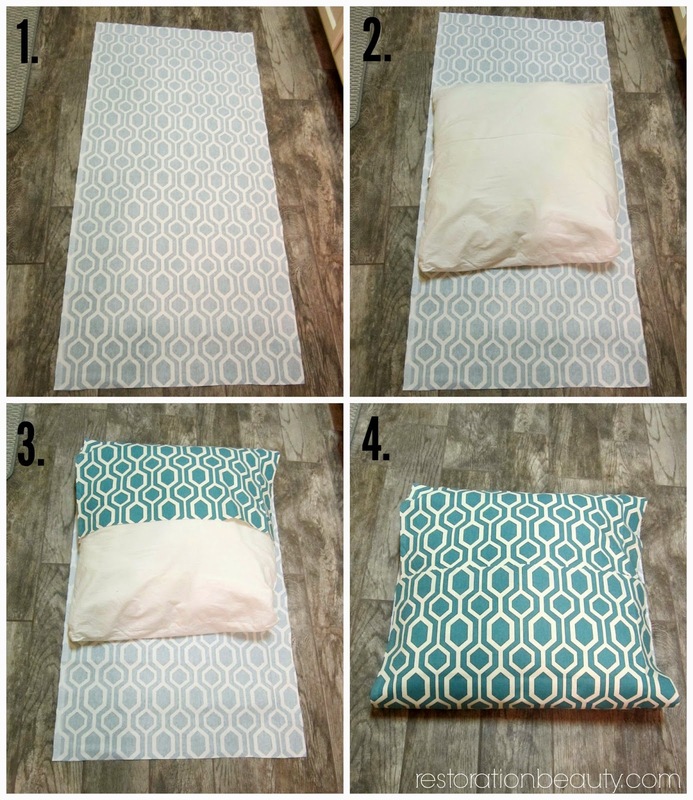 I could have glued it down 1/2 an inch to create a hem but opted not to....maybe I should have called this post the Lazy Way To DIY a Floor Pillow! Now my two favorite people in the world each have their own comfy floor pillow to relax on while we enjoy our Summer movie nights! And they're not a bad addition to my home decor, either!! I keep them next to our T.V. stand and I just love the color and patterns they add to our Living Room! Please pretend you didn't see those nasty cords under the T.V. stand! 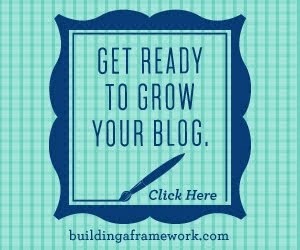 I need to get on that ASAP and I just know my blogging friend, Lisa is having a cow right now!! But aren't they oh so pretty?!! 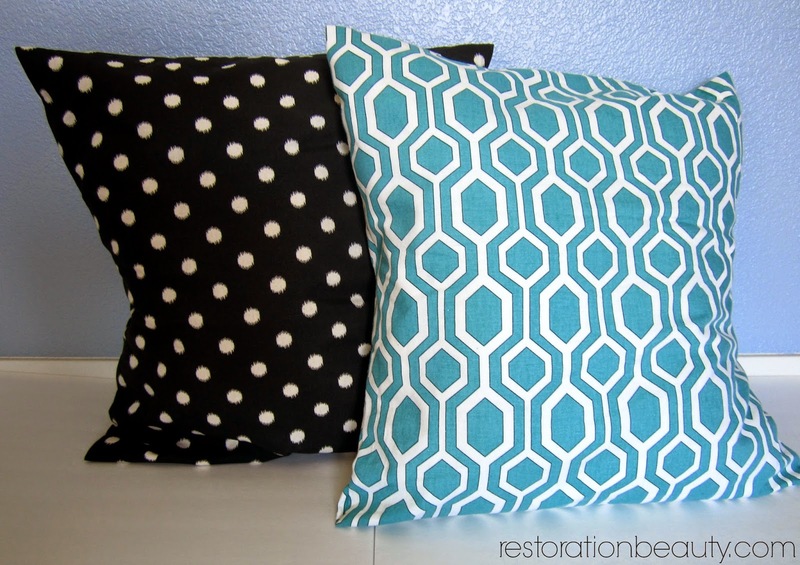 These were so much easier to make than my No Sew Pillow Covers Made from Napkins! The fact that you are only working with one long strip of fabric as opposed to two just makes a world of difference! 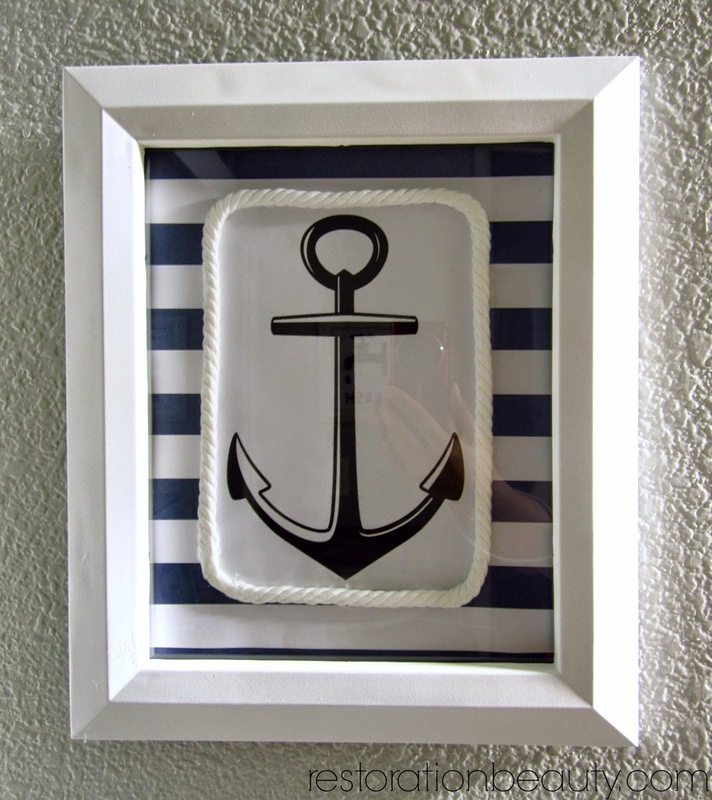 Do you cut any corners when you are DIY'ing? So cute! I have to do this! What a fun project! I love this! I am always looking for guest bloggers on my website Blissful an Domestic. 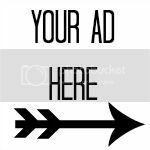 My blog is about creating a beautiful life on less and this post fits right in with that :) Check out my blog and see if it would be a good fit for you. I'd love to have you! Thanks, Madalyn!!! I would love to see yours if you do try them!! Thanks Julia! 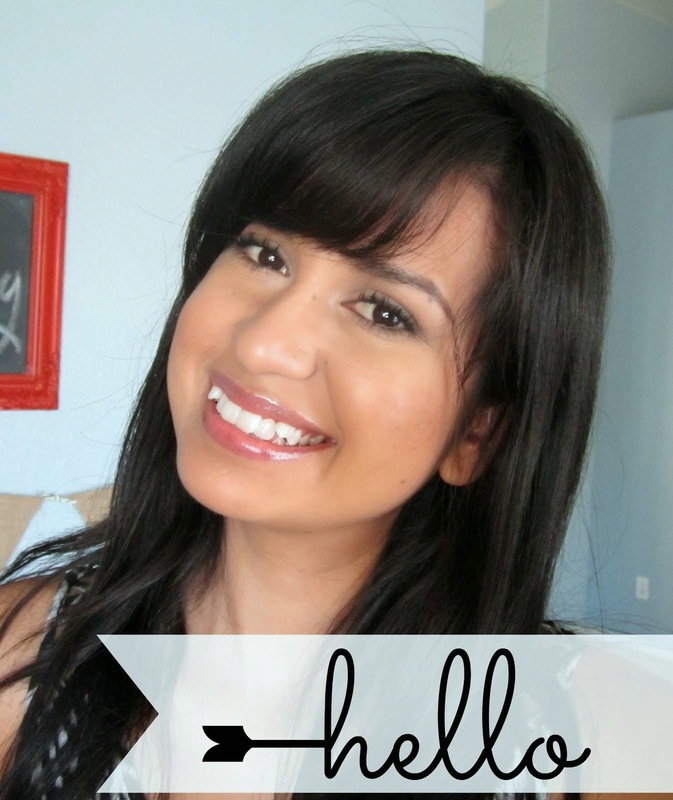 They're so easy and fool proof so they are perfect for a no sewing gal like me!! Thanks for sharing! You're the sweetest! HI Lisa!!! I thought for sure you'd cringe!!! 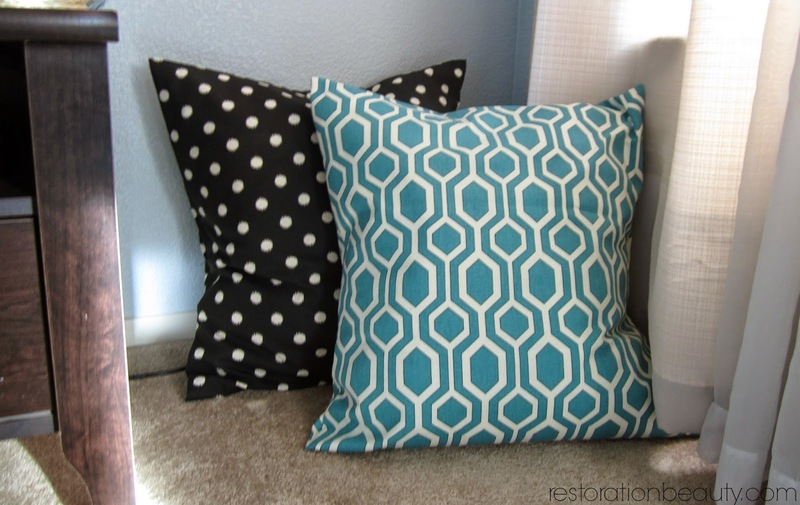 Love quick and easy projects like this and my kids would love large floor pillows. Thanks for sharing this project on Merry Monday. 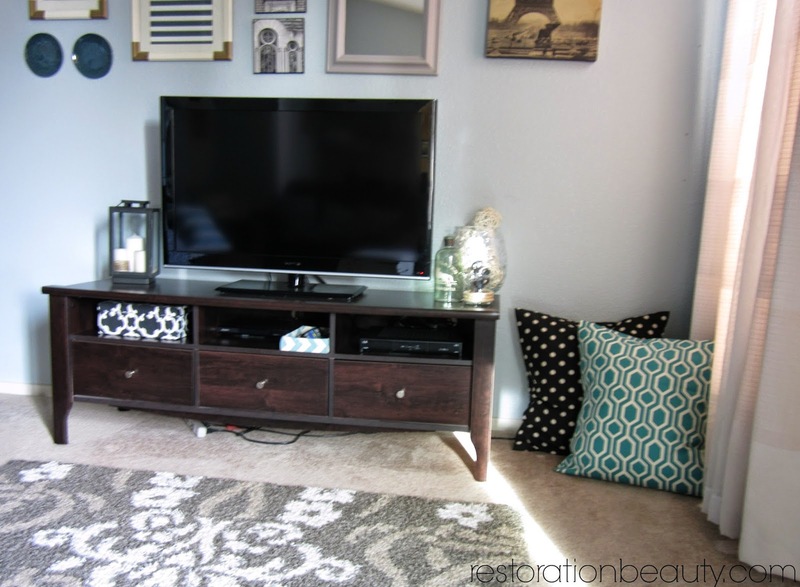 These are the types of DIY projects I look for! I can't sew a button on a shirt, much less pillows. Matter of fact I wouldn't even know how to turn on a sewing machine...do they even have an on/off switch? 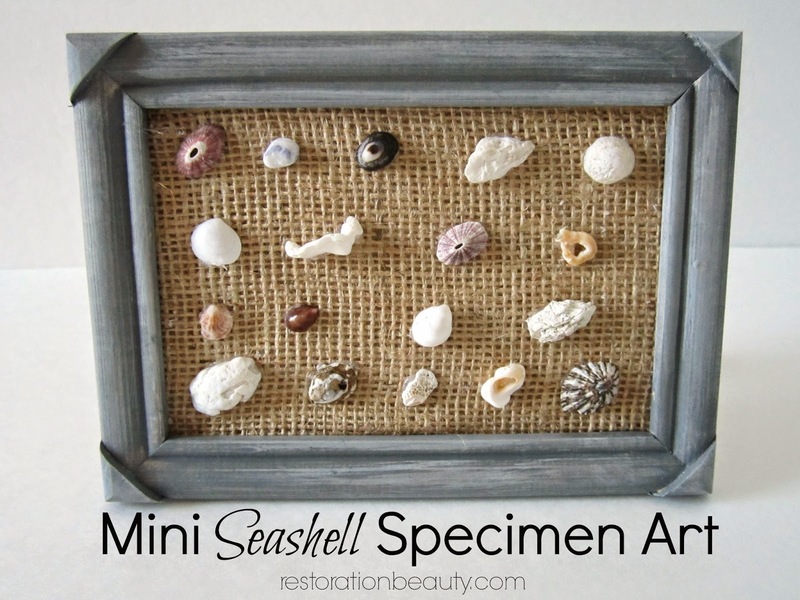 I will be making some of these for my kiddos! These are too cute, Selene! I am ALL FOR the lazy method, lol! Thank you bunches for linking up and partying with us this week! Glad you liked them, Erlene!! Thanks, Christine!!! The hubby and daughter are sure enjoying them! Hi Adrian!! I'm glad I'm not the only sewing challenged girl out there!! I'm sure your kiddos will love these pillows!! Haha, Christine!! Go get that glue girl!! Thank you, Kristi!!! They are definitely loved around here! Beautiful. I want a pillowcase and I don't know how to sew. I'm so happy I found your blog. I made this today for my mother! It came out perfect, thanks for the awesome tutorial! Which floor pillows you pick will rely upon your home, the measure of your family and what number of individuals visit you all the time. Floor pillows are a great method to supplement your seating in your home without taking up a considerable measure of room.I find a very good website for the best best pillow for side sleeper with neck and back pain. you can visit this site. These sheets are not only comfortable, but they are very affordable and will fit any budget. 100 silk sheets As a rule, select bed linens that complement with the overall bedding furnishings and your room as beauty also counts. Woa, such a nice post, Thanks for sharing it. That's nice and easy to make a pillow buy your own way. You can decorate your room with it. Thank you so much for this useful information. It is really helpful. Actually, even I want to share some information about an Australian assignment help organisation named ONLINE ASSIGNMENT EXPERT. I have been working in this firm as an economics academics writer for 3 years. I want to throw some light on our online academicians who possess a diverse range of knowledge in a plethora of subjects such as economics, management, law, nursing, IT, and many others. The experts work here 24x7 and help students secure the grades they desire by providing reference assignments which are finely crafted in accordance with the marking rubric. So, anyone seeking assignment help in Melbourne, Sydney, Perth, Brisbane or any other Australian city cane easily get in touch with our assignment providers at Online Assignment Expert. In addition to this, the free copy of Turnitin report which is provided with the reference assignments by us validates our authentic work. So, contact our assignment makers, if you need any assistance with your assignments.